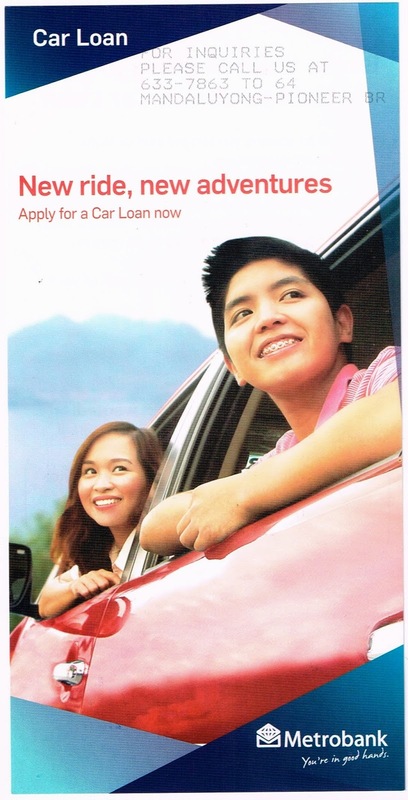 Apply for a Car Loan Now..
Use it to acquire passenger cars or light commercial vehicles. Get high loan amounts of up to 80% of the net selling price at very competitive interest rates with terms ranging from 12 to 60 months. Start by talking to the officers & staff of your favorite Metrobank branch. Also, Hurry! You can still qualify for 3X REWARDS POINTS when you use your MasterCard Classic. Simply spend anywhere from August 1 to 31, 2014 for a minimum of P5,000 retail and merchant installment. Plus, convert your unused limit to cash with Cash2Go at 0.99% up to 36 months installment term or take advantage of our low rate Balance Transfer at 0.68% up to 24 months installment term. Call (02)8700766 to avail. T&Cs apply. Per DTI# 5098. And Use your Metrobank credit card at the Hot Brands Sale and enjoy up to 70% OFF select items from Robinsons Appliances, Toys R Us and True value. Sale is from Aug 23-24, 10am to 10pm at the Ruby-Opal Ballroom & Jade Function Room at Crowne Plaza Manila Galleria. 0% installment also available. T&C apply. DTI-FTEB SPD#1919S2014. Get the car you've always wanted! For more information, call our Customer Service Hotline at 8700-700. Outside Metro Manila, call Toll-Free at 1-800-1888-5775. For inquires please call us at 633-7863 to 64.